I have been told off for describing Acle elsewhere on this site as rather a dour place, although it is really the traffic which spoils it so, and it isn't the place's fault. It is the main river crossing of the Bure between Norwich and Yarmouth, as well as being the place that the A47 and the main railway line come together to cross on their journey between Norfolk's two largest settlements. And it feels as if it has a busy life of its own, which must be a good thing. 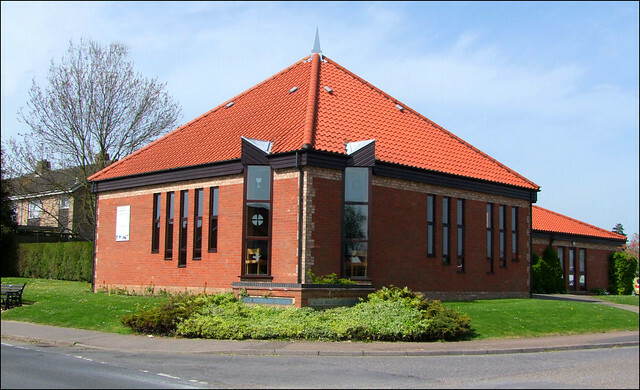 This fine modern chapel sits beside the library on the road out of town towards Stalham. Using vernacular materials, but with a number of pleasing post-modern details, it is a surprise to learn that it is already more than twenty years old, having opened in 1989. How it came to be built is an interesting story. We have explored elsewhere on this site the rise and fall of Methodism in England in general and Norfolk in particular; what was the great ecclesiastical enthusiasm of the late 18th and early 19th Centuries has lost more of its members in the last half a century than almost any other mainstream denomination. Methodism was very strong in east Norfolk, and almost every village had its own Methodist society and chapel. Some had more than one; there were various strains of Methodism before unification in the 1930s, at which point many of the chapels fell out of use. In recent years there has been an inexorable decline in congregations, and most chapels are not significant enough buildings for outsiders to wish strongly for their continued use. For example, in the late 1980s there were still working Methodist churches in the neighbouring villages of Stokesby, Runham and Filby, just to the north of Acle: now, all are gone. But it wasn't the sales of the old chapels and their land which funded this new church. It was the dualling of the A47 through Acle, taking the traffic out of the town centre but putting it firmly in the path of the old Acle Primitive Methodist chapel. The chapel was already proving inadequate; as the village chapels closed, the catchment area of the Acle community was spreading wider and wider, and in compensation for the road the Department of Transport agreed to pay for the building of a new church on the other side of Acle. It is now the proud flagship of the Acle and Loddon Methodist Circuit.